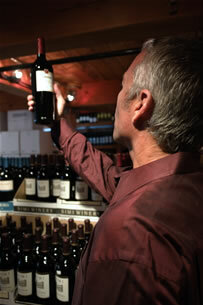 The largest segment of wine consumers is still "overwhelmed" and under-informed about wine choices. The fact that most people in the wine industry are "enthusiasts" may blind marketers to the other categories of consumers and their needs. Constellation is sharing its findings in order to benefit the entire wine industry and help make wine more relevant to consumers. As wine consumption in the United States reached an all-time high in 2007, wine producers celebrated the long-awaited arrival of a "wine culture" in America. But according to an 18-month study commissioned by Constellation Wines U.S., a large segment of the consumer population is still "overwhelmed" by wine. The results of "Home & Habits," the second phase of Constellation's "Project Genome" study, were released March 7 at a news conference. "Our industry needs to do more to become more customer focused," said José Fernandez, president and CEO of Constellation Wines North America. The original 2005 study of 3,500 wine drinkers was one of the largest consumer research projects ever conducted by the wine industry. The new study examined the purchases of 10,000 premium-wine consumers--defined as those who purchased wine priced at $5 and higher--during an 18-month period. While the first Project Genome study asked online survey participants to recall their wine purchases during the last 30 days, the Home & Habits study tracked the actual purchases of Nielsen Co.'s Homescan consumer purchase panel, which employs in-home bar code scanners and surveys to map consumer buying behavior across a demographically balanced sampling. Nielsen measured consumer attitudes and purchase behavior within multiple purchase channels, including warehouse clubs, supermarkets, mass merchandisers, drug stores, liquor stores and wine shops. 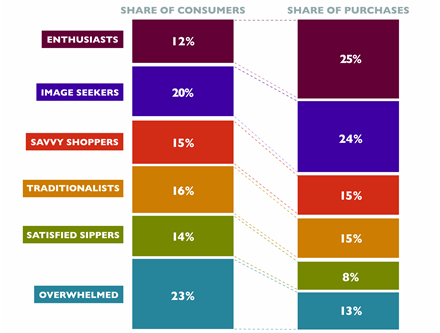 The scan data were supplemented with online interviews to classify consumers by Project Genome consumer segments identified in Constellation's original study: Enthusiasts, Image Seekers, Savvy Shoppers, Traditionalists, Satisfied Sippers and Overwhelmed. If information is confusing, they won't buy anything at all. Don't dine out often, but likely to order the house wine when they do. 47% buy wine in 1.5L size as "everyday wine" to supplement their "weekend wine"
98% buy wine that costs more than $6 per bottle, which accounts for 56% of what they buy on a volume basis. With the highest percentage of consumers falling into the "Overwhelmed" category, Leslie Joseph, Constellation's vice president of consumer research affairs, commented: "We need to do a better job as an industry of helping these people understand what a wine's going to taste like." Fernandez said he sees the situation as a chance to increase overall wine sales in the U.S. "We've under-communicated to these consumers," he said. "Increasing per capita consumption in the Overwhelmed category is our biggest opportunity.…If we do nothing, today's Overwhelmed will be tomorrow's Overwhelmed." The fact that most people who work in the wine industry are Enthusiasts may account for the industry's failure to understand Overwhelmed consumers, Fernandez added. Joseph pointed out that the industry also needs to pay more attention to Traditionalist consumers, who tend to prefer established wine brands. "It's perhaps not the most exciting segment to be talking about" for sommeliers or retailers, she said, "but it's very important to keep these consumers in mind." "All six of these segments are coming into your establishment on any given day," said Ed LeMay, senior vice president, channel management, Constellation Wines U.S. "The key is in what proportion." Constellation will use insights from the Project Genome Home & Habits study when consulting with retailers and on-premise establishments in developing more comprehensive wine plans, from updating grocery displays to "clustering" selections by geography, lifestyle and preference. "Any time we can learn more about our premium-wine consumer, it's an opportunity to serve them better," LeMay said. Fernandez said the study results are especially important to Constellation now that it has divested itself of "jug wine" brands Inglenook and Almaden, and is focusing on becoming a leader in the premium wine segment. Constellation chose to share top-line findings of the new research as a service to the industry, Fernandez said. "In the end, we all benefit when we know consumers better, and can make wine a more meaningful and relevant part of their lives."